The forum software crashed, and I'm just now getting it operational again. Sorry about that. My fields are harvested, tilled, and the overwintering crops have been planted. I'm working on getting seeds ready to share. Some of the promiscuous hybrids that are currently growing in my bedroom window are 7 way crosses. I'm currently 3 to 5 generations into this project so I'm expecting good things for this growing season. So far, the genetics that have been incorporated from the wild plants is very narrow. Eventually, I'll want to incorporate a wide variety of wild genetics. I expect to do most of that work after I get the self-incompatibility trait stabilized. On October 26th, yesterday, I finished harvesting the fields, and tilled. They are ready for winter! Before snow-cover arrives, I want to plant a few winter-hardy crops like garlic, rye, wheat. It was a great growing season. My cowpea and tepary bean landraces finally matured this growing season. I'm very happy with them. Since it was the international year of the pulse, I also grew fenugreek and lentils for the first time. The lentils did wonderful. They were a grocery store variety. Not yet a landrace, but at least I can grow them. The fenugreek made some seed, but didn't prosper being transplanted. The runner beans did well. I even found a few with tuberous roots! The common beans thrived. I'm very content with the new flour corn I selected from the out of the hybrid swarm of North/South varieties. I'm calling it Unity Flour Corn. 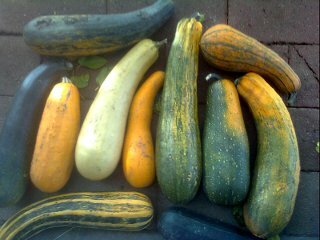 I grew a patch of squash which were interspecies hybrids between mixta and moschata squash. I'm really loving those. It would be nice to move the orange color and better taste of the moschata squash into the cushaws. Yellow mustard spice and breadseeds thrived. 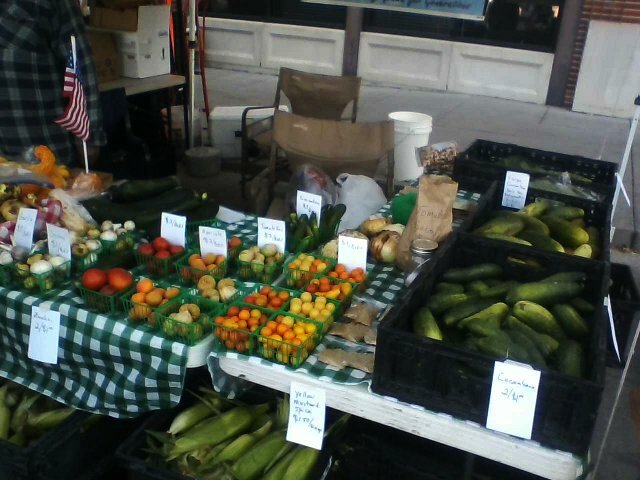 October 22nd will be the last farmer's market for the season. We'll bring honey as always. Stock up now to save a trip out to Paradise during the winter. I've been picking lots and lots of apples, and will make them available by the half-bushel for a great price: $10 per half-bushel. I've also dug carrots: Huge carrots great for soups and cakes. 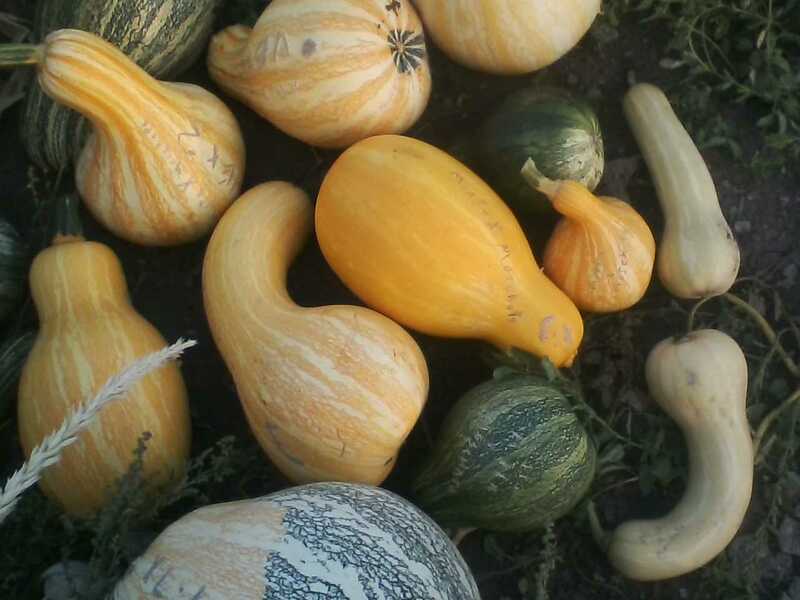 There is a little bit of winter squash left, and lots of decorative gourds, and some pumpkins. I'm bringing pumpkins with hull-less seeds. Carve a jack-o-lantern, and save the seeds. There are no annoying shells to remove before eating the seeds. I'm bringing some already dried pumpkin seeds, sunflower seeds, and yellow mustard spice. I'm expecting to pick some sage. There are a few tomatoes left. I'm expecting to bring turnips with greens. Canadice Pink. Seedless. Small fruits. Tart Mid-season. Concord Black. Seeded. Mild flavor. Very Late. Glenora Black. Seedless. Tart and sweet. Vigorous. Very tasty. Late. Interlaken Green. Seedless. Very Sweet. Vigorous. Earliest. Pink Table Grape Pink. Seeded. Sweet and Mild. Mid-season. Two Mystery Varieties Unknown. Unknown. I have vineyards now which are separated in elevation by 300 feet. That should help provide an extended harvest for each variety. We're heading into the farmer's market in a few minutes. We are bringing honey like always. The truck is filled to capacity with butternut and maxima winter squash. Pricing is $10 per crate for storage squash, or $1 to $4 for smaller squash. Maybe up to $10 for some of the 60 pound maximas. There was a second crop of buttercups. I am thrilled because they are my favorite tasting and best selling squash. 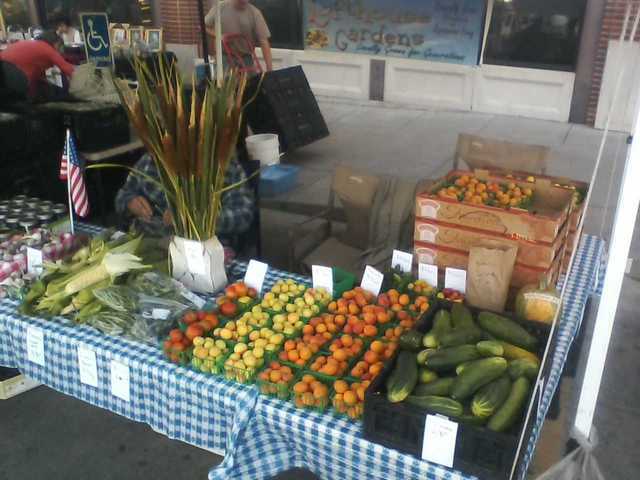 There are also a few birdhouse gourds and mixta squash. I'm bringing Glenora black seedless grapes. They are my favorite tasting variety. I'm also bringing rooted cuttings. 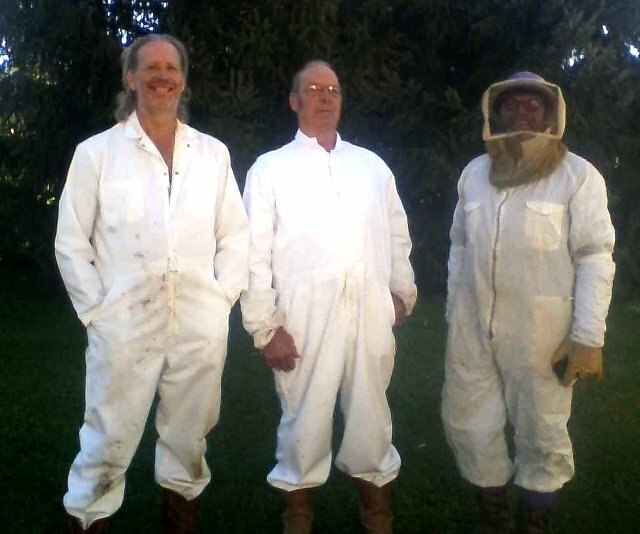 Here we are just before we robbed the honey a few weeks ago. Pants tucked inside boots, to avoid bees crawling up pant-legs. The year previously, on a "check-only" day, I thought that I'd get by with the wrong pair of boots. Bad choice. They stung my ankles like crazy!!!! Good thing that I had taken an anti-histamine prior to entering the bee yard. 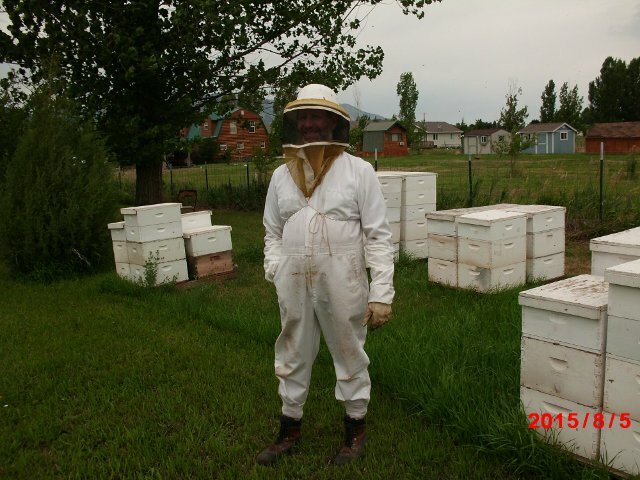 That year, we had some really pissy bees. 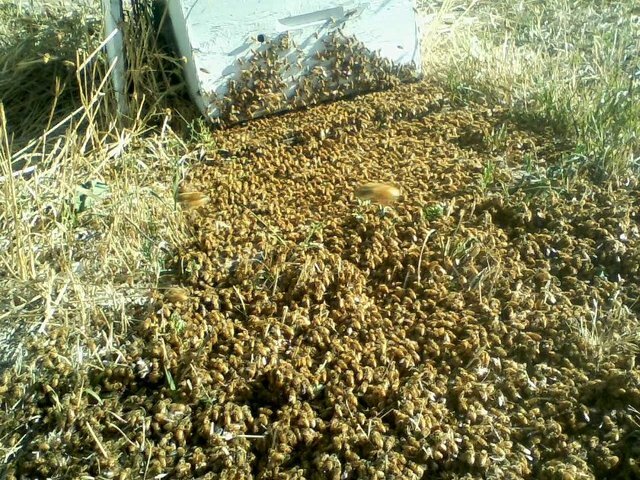 The queens or the queen's mother's in two colonies may have got impregnated by some africanized drones. 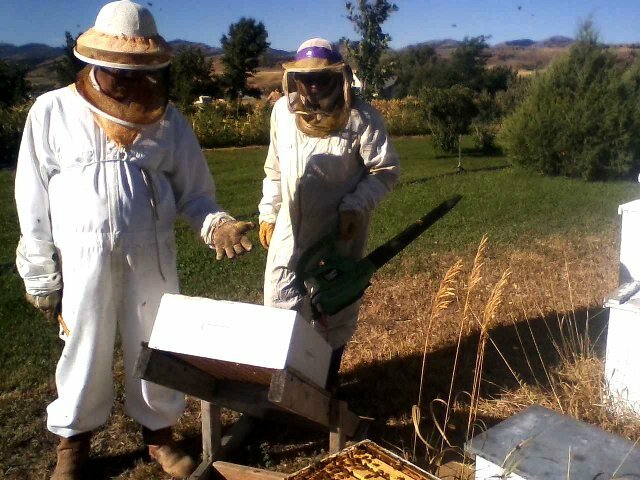 We use a leaf-blower to remove the bees from the honey boxes. In the spring of 2016, all 30 colonies were dead. So we replaced them with packaged bees. 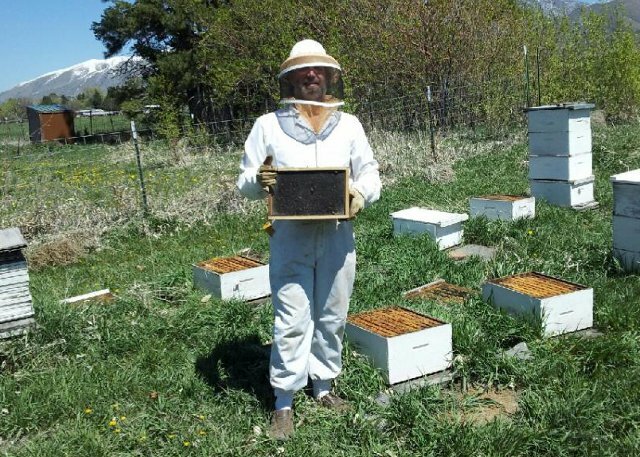 At $100 per colony, the bees in the bed of the truck I went to pick them up in were worth more than the truck. The truck is loaded and ready to go to market first thing in the morning. And perhaps a few things I forgot to mention. Dry beans may be ready to harvest next week. I just started picking the earliest of the early. With frost expected any day now, I expect that I'll start bringing winter squash next week. 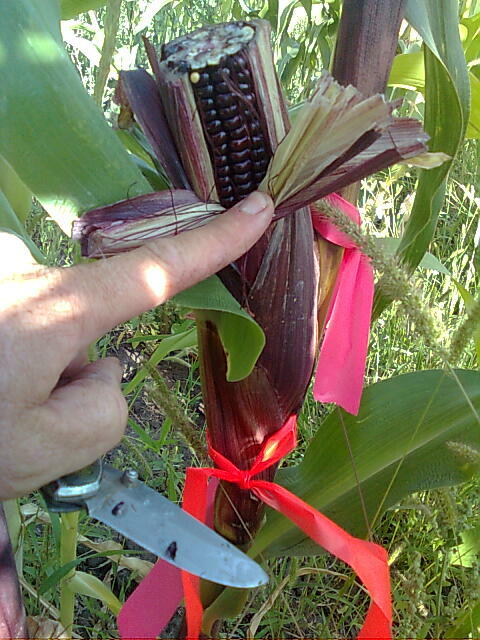 corn seeds are viable by the fresh eating stage, even if they are not yet fully mature, so you could pick and taste cobs then dry out any that taste great to save for seed. I taste sweet corn by chopping off an end of the cob with a pair of secateurs (or more dangerously with a knife)... I can taste it a number of times during a growing season. It looks like this after a few tastes. Also, corn plants often produce multiple cobs per plant. We expect to have about the same sorts of things next week. I'm working today on getting the breadseed poppies ready. I think that I'll get one more harvest from the juicy apricots. Also for the market on September 3rd, I'm expecting to have crates of sweet corn for freezing. Price will be $10 per crate. It was the best seller last week. As always, we don't apply poisons to the garden. We eat this stuff too, and one of the rules that I live by is "Nurture yourself with vibrantly healthy food". It's the one year anniversary of my new living arrangements. I feel great. People are telling me that I look great. My garden has been cared for really well. One of my long-time friends says, "This is the the best garden you have ever grown." I agree with her. My weight is down 60 pounds from my maximum weight. I'm hovering around the lowest weight that I have been in decades. It's easier to move. Phantom aches and pains are greatly diminished. I am rarely congested these days. I haven't had a cluster-headache for a year. I'm eating a mostly paleo-like diet containing few grains. I have really been enjoying visiting with friends and family. Every day of peace and tranquility seems like an excuse to celebrate life and the rich bounty that surrounds me. This week daddy is bringing honey, and garlic. He usually brings a bouquet of flowers as a table decoration. Offer him about $5 for it and he's likely to let you take it home with you. Bringing lots of fava beans. I really like them sautéed in butter, or added to a stir-fry. The pod is fibrous, so they should be shelled first like shelling peas. 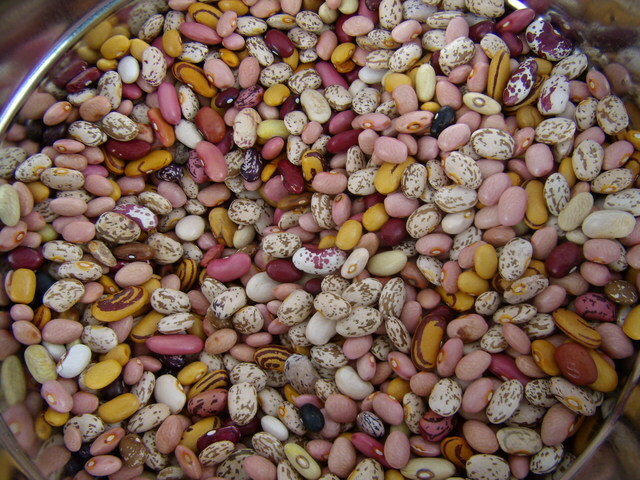 Some people like to shell the individual beans, but I like eating the skin. To me, it's part of the charm of fava beans. Sorry that I forgot to harvest Mullein. If you are into wild-crafting, you might check to see if it's starting to flower. That's a perfect time to pick it. I'm bringing a few potted plants: Toothache plant, spearmint, thyme. And the last older potted grape vine. It's Interlaken, a green seedless that does very well here. I'm expecting to bring more varieties of grape vines next week, or the week after, depending on how they grow between now and then. I'll bring Egyptian Onions if I remember to throw them on the truck in the morning. I thinned the carrots and beets, so I'm bringing a few small ones. 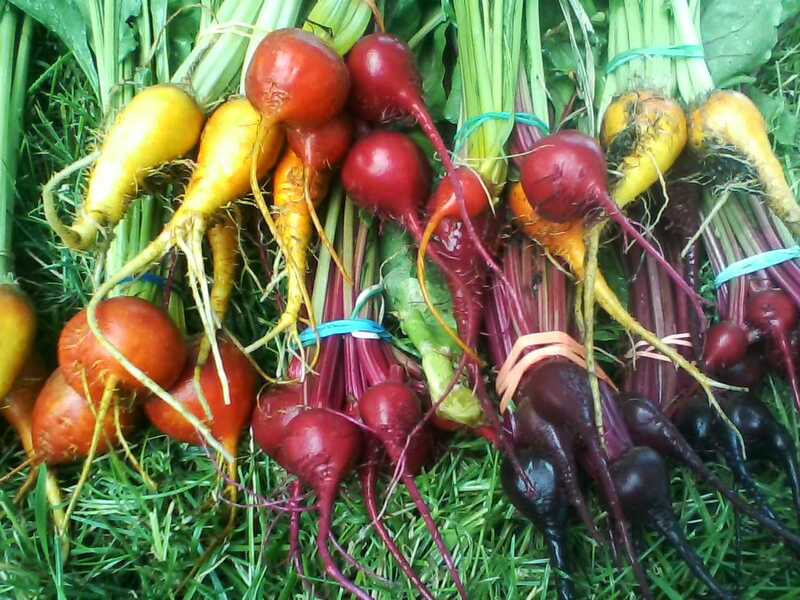 The beets are beautiful colors. The greens are very luscious right now.